Future action movie in a run-down Detroit in which the police is run by a multinational corporation very aptly called OmniCorp. They are looking for the future of law enforcement which definitely isn't the local police force that's on strike. One of the possibilities is a giant robot stolen straight from the Imperial Walkers in Empire Strikes Back. Alas, the machine malfunctions and blows away a poor exec during a demonstration at a board meeting and the search is on again. Enter Murphy (Peter Weller - who got the role because he was the only actor willing to undergo the strenuous make-up sessions). Murphy is blasted to bits by a bunch of the vilest and nastiest caricature baddies we have seen in a movie for a long time and then resurrected as the Robocop of the movie's title - sort of the comic book Judge Dredd crossed with The Terminator. Plenty of violence, gore and profanity directed in a wildly over-the-top style by famed Dutch director Paul (Total Recall, Basic Instinct) Verhoeven. Some of the violence is darkly humorous (especially the scene mentioned where the hapless exec gets it) and the movie wouldn't have worked if not for this. Manic, fast-paced and outrageous, Robocop is a classic of its genre. Don't miss it - even if you can't really stomach violence: it is a glorious comic book come to life . 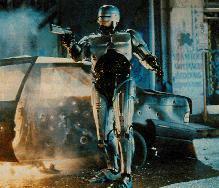 . .
Read about the planned Robocop remake.